Tokyo 2020: New Olympic Stadium for only $1.3 billion? 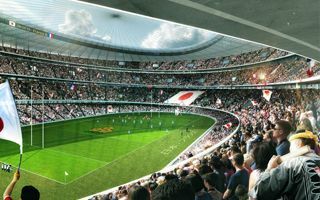 The Japanese government has set a cap on the new national stadium at ¥155 billion. Roughly a fourth of this amount will be contributed by Tokyo city hall if agreement is reached. Known primarily for the outrage it caused regarding the price, Tokyo’s new National Olympic Stadium now has price capped at ¥ 155 billion (or $1.3bn). This represent a huge cut in spending comparing to the ¥ 252-300 billion that would have made it the world’s most expensive stadium by far. While soaring cost was the main reason for dropping the 2012 Zaha Hadid design (and indeed key guidelines of the entire competition by Japan Sport Council), the new one’s budget is still subject to negotiations. The government has set the limit at 155 billion, but this sum presumes Tokyo city hall will contribute no less than ¥35-40 billion (not including surrounding infrastructure cost), which will be subject to talks on Tuesday. Keeping the budget from growing required some crucial changes in future usability. The stadium will not have a retractable roof or mobile stands that would accommodate football and athletics equally well. Both these features are very expensive and were scrapped. Currently two large consortia are fighting for the design + build contract. Taisei Corporation teamed up with architect Kengo Kuma, while famous Toyo Ito is designing his concept together with Takenaka, Shimizu and Obayashi corporations. Groundbreaking on the long-delayed project is expected in early 2017 and delivery in late 2019 or early 2020.